In Breakthrough’s 2013 report, How to Make Nuclear Cheap, we argued that nuclear needed innovative new designs to become radically cheaper, able to displace fossil fuels. But in the aftermath of that report, we uncovered a large disagreement about why nuclear power became expensive. In particular, many critics have claimed that cost escalation and “negative learning” are intrinsic to nuclear power. 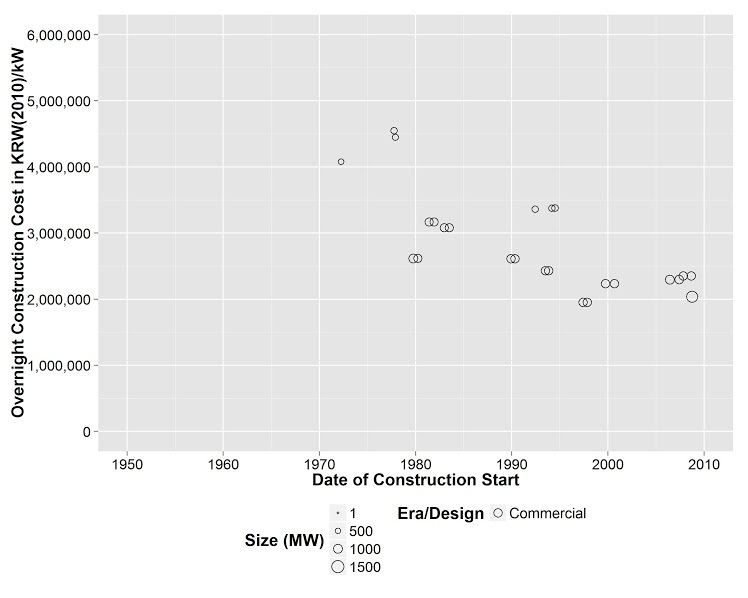 The available data was inconclusive, with the existing literature on the construction costs of nuclear power reactors focusing almost exclusively on trends in construction costs in only two countries, the United States and France, and during two decades, the 1970s and 1980s. These analyses, Koomey and Hultman (2007), Grubler (2010), and Escobar-Rangel and Lévêque (2015), encompass less than one-third of reactors built globally between 1960 and 2010, providing an incomplete picture of the economic evolution of nuclear power construction. We set out to collect and analyze a much broader data set from a greater diversity of nuclear nations, and the results have now been published in a ground-breaking paper, Historical Construction Costs of Global Nuclear Power Reactors, in the journal Energy Policy. Authored by Breakthrough’s Jessica Lovering and Ted Nordhaus along with Arthur Yip from Carnegie Mellon University, this paper examines complete construction cost histories for the nuclear industry in seven countries and tells a very different story than the mainstream narrative. 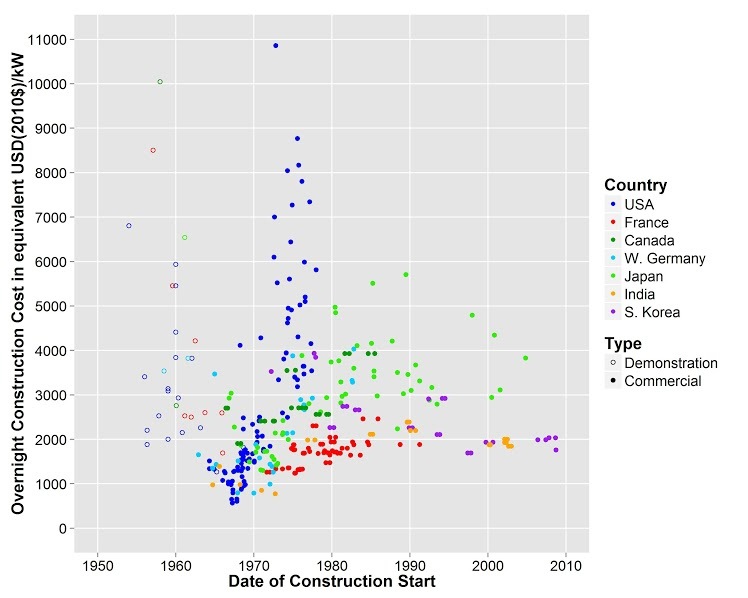 The paper curates historical reactor-specific overnight construction cost (OCC) data that broaden the scope of study substantially, covering the full cost history for 349 reactors in the US, France, Canada, West Germany, Japan, India, and South Korea encompassing 58% of all reactors built globally. We find that trends in costs have varied significantly in magnitude and in structure by era, country, and experience. In contrast to the rapid cost escalation that characterized nuclear construction in the United States post-Three Mile Island, we find evidence of much milder cost escalation in many countries, including absolute cost declines in some countries and specific eras. Our new findings suggest that there is no inherent cost escalation trend associated with nuclear technology. When cost trends are compared across these seven countries, we find that the US case is an outlier. Even the existing literature on the US and France tends to ignore the early demonstration and commercial reactors. When looking at this full set of 349 reactors, we can see that later countries saw less cost escalation that the US, with costs stabilizing in recent decades. South Korea has a unique trend compared to the other six countries in our data set, with a continuous decline in costs over time. What makes South Korea’s industry unique is that they started their nuclear program by importing large foreign reactors, skipping the early demonstration phase and not developing their own indigenous reactor design until later. More importantly, all of Korea’s nuclear power plants are owned and operated by a single utility, Korea Hydro & Nuclear Power, whichwho also designs and builds the reactors. When looking at the history of nuclear costs in the US, it’s easy to blame the accident at Three-Mile Island for the rapid cost escalation in the later 1970s. 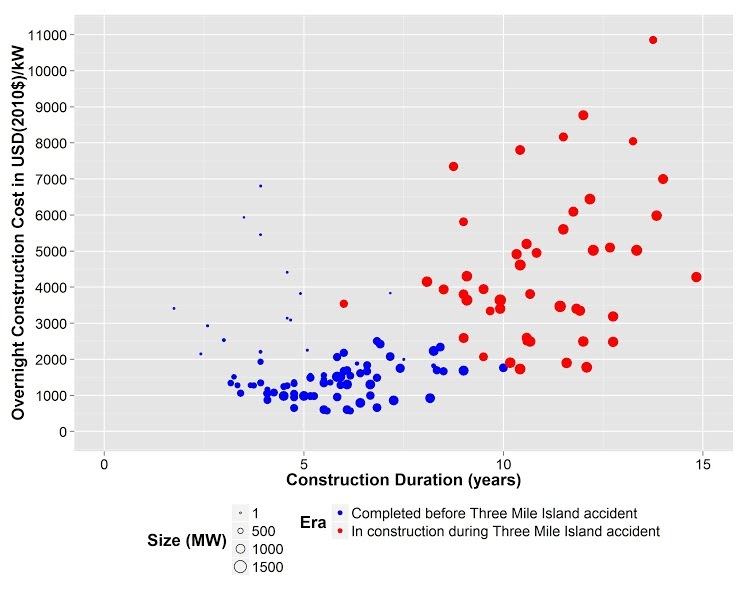 Looking at the chart below, both construction costs and duration explode for plants that were under construction at the time of the accident (no plants began construction after the accident until 2009). But it is also notable the large variance in cost and duration. For example, the second to last reactor completed in the US, St. Lucie-2 in Florida, was completed in just six years at a cost of $3,100 (2010USD), relatively competitive for large power plants. After this period of regulatory and utility flux, how would costs have evolved? This dataset and paper are only the beginning of Breakthrough’s work looking at the cost of nuclear. There are dozens of probable causes for theses cost trends that need to be explored in further work. While it appears that design standardization, economies of scale, multi-reactor siting, single developers, and regulatory stability all help to keep costs down, other effects such as demand for electricity, power sector structure, economic growth, and manufacturing capabilities may play an equal role in driving these trends. View the open access paper here. Download the cost data (as xcel or csv) and the guide to the data here.